Defined by its welcoming shapes and elegant slats, the Kafelonia Collection is generously proportioned to allow for unrestricted movement in the chair while offering lasting comfort. Including a lounge chair, side table with detachable serving tray, and ottomans/coffee tables (24" and 36"), this deep seating collection embodies contemporary luxury. 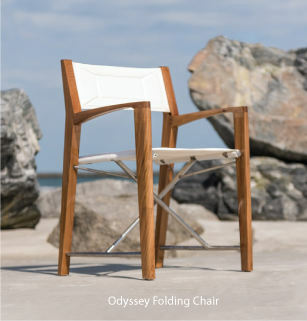 The Kafelonia Collection is rapidly increasing in popularity for use on the world's finest vessels and luxury resorts. We now offer an exclusive high gloss, marine grade, long lasting treatment called the Yacht Marine Finish that intensely beautifies and captures the elegance of this particular piece. Please contact us for a quote if you are interested in the Yacht Marine Finish. Quality Rated "Best Overall" by the Wall Street Journal.